The agency proposes adding three categories to a law forcing product makers to pay for disposal. Help may be on the way for anyone with a garage filled with half-empty cans of paint. Currently, anyone with such a collection must find someone willing to accept the old paint as a donation, or, in the case of latex, the paint must be allowed to harden before it will be accepted by a waste facility. But the Department of Environmental Protection has proposed adding paint, along with prescription drugs and syringes, to the list of products in Maine for which manufacturers are required to pick up recovery and disposal costs. The DEP’s proposal, detailed in a report to the Legislature, was made under a nationally recognized product stewardship law that legislators approved unanimously in their last session. The Maine Chamber of Commerce and environmental groups both supported the measure, which created a process for regularly adding new product categories. But whether the new Legislature will agree to the DEP’s proposed additions is far from certain. “It is obviously a different political climate,” said Rep. Melissa Walsh Innes, D-Yarmouth, who sponsored the product stewardship legislation. The law requires manufacturers to set up and pay for their own recovery programs for covered products. If they charge new fees to do so, the fees may not be characterized as government-imposed or a tax. While there has been little opposition from industry groups to the creation of recovery programs for paint and hypodermic needles and other so-called medical sharps, the pharmaceutical industry is expected to put up a fight to keep prescription drugs off the list. The industry’s trade association, Pharmaceutical Research and Manufacturers of America, opposes the Maine program. The association calls it a patchwork approach to a problem that needs to be solved through national standards. “When federal rules have been finalized by the U.S. Drug Enforcement Administration, they will provide detailed steps and safeguards that should be followed by drug take-back programs all over the country, including Maine,” said Ed Belkin, an association spokesman. The DEP is also recommending carpeting, packaging and printed paper, alkaline batteries, plastic bags, phone books, mattresses, furniture and construction and demolition debris as candidates in the future. Product stewardship, also called extended producer responsibility, is the hot new trend in recycling. The programs aim to keep potentially harmful products out of landfills, incinerators and sewage systems. The idea is to make the manufacturers and consumers pay for disposal of the products, rather than municipalities and local taxpayers. Maine has been a leader in product stewardship nationwide. Advocates and opponents of product stewardship are watching the progress of the state’s new law, which leaves it up to the Legislature to decide which products are subject to the program. Maine was among the first states to launch a product recovery program, requiring producers to set up collection systems and recycle dry cell mercuric oxide and rechargeable batteries in 1994. In 2004, the state enacted the nation’s first electronic waste recycling law for television and computer monitor manufacturers, which has nearly doubled the poundage of recycled electronic waste per year from 4.1 million pounds in 2006 to 7.9 million pounds in 2009. Today in Maine, recovery programs have been set up for five product categories, including mercury auto switches, mercury-added thermostats and mercury-added lamps. The state is second only to California, which has six categories, according to the Products Stewardship Institute Inc. Thirty-three states have product stewardship laws, many of them modeled on those adopted by Canada and the European Union. Carole Cifrino, program manager for stewardship programs at DEP, said that in drawing up their product recommendations for the Legislature, her department decided to focus on hazardous household products that had long posed disposal problems. DEP estimates that Mainers generate more than 200,000 gallons of waste paint annually. Paint was included on the list because it can contain toxic materials, such as heavy metals and volatile organic compounds, and it is difficult for solid waste facilities to handle. Latex paints are recyclable and oil-based paint may be reblended for use in fuels. Unused medications made the list for environmental, public safety and public health reasons. The DEP report noted Maine has the highest rate of prescription drug related crime in the country. The state now sees more deaths from accidental or intentional abuse of prescription drugs than from automobile accidents. Prescription drugs tossed out in trash or flushed into the sewage system are showing up in fish, worms and other organisms. Voluntary collection programs are costly. The four-hour collection conducted by Midcoast Hospital in Brunswick — which nets almost of a ton of material twice a year — costs $10,000. Syringes and lancets were added to the list because they are routinely discarded in the trash and pose health dangers from the transmission of blood-borne pathogens to the sanitation workers, sewage treatment plant operators and others who come into contact with them. 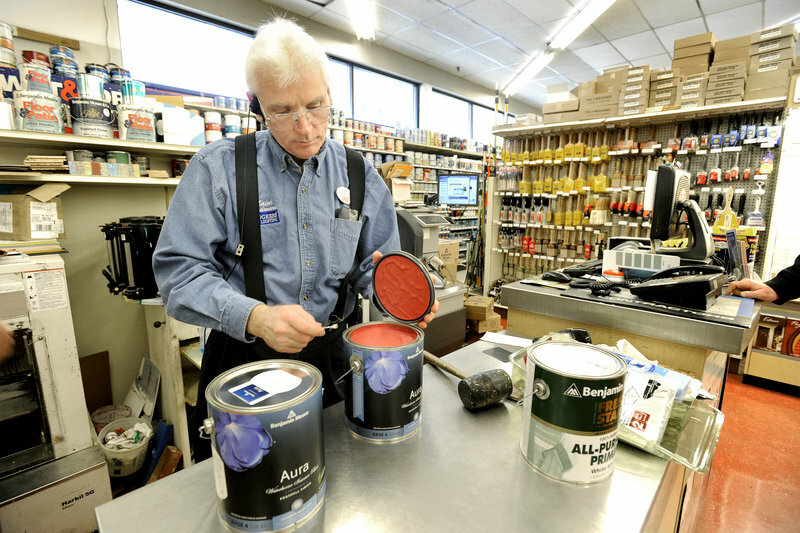 Tom Skelton, president of Maine Hardware in Portland, said his customers struggle with paint disposal. He said a product stewardship program for paint might have some benefits. “If it is across the board and fair for everybody I think it is fine,” he said. DEP is seeking public comments through Jan. 7, which will be sent along with its report to the Legislature for possible action next month.